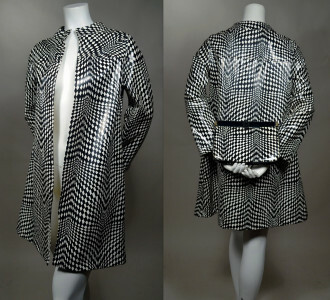 MOD 1960's vintage "WET LOOK" vinyl coat and matching clutch. Black and white geometric OP*ART print cotton jersey backed vinyl. (Shiny vinyl was new and referred to as "wet look" in the 60's.) A-line, open front. Funnel collar. French seamed front & back yoke. Long sleeves. Side seam pockets. Two compartment clutch handbag with center zip pocket. Black vinyl top edge with tabs and piped edges. Snap hinge closure. The UTMOST in MOD! Shoulder, measured across back - 15"
Sleeve, measured from seam to cuff edge- 21"
Back length, measured from neckline to hem edge - 33 1/2"
Very good condition. Coat shows light wear to cuff edges & collar edge, small glue repairs inside at pockets (not seen when wearing) and very small inconspicuous paint mark at back hem. Handbag shows slight discolor & wear, marks & soil inside. Chain handle has been removed.